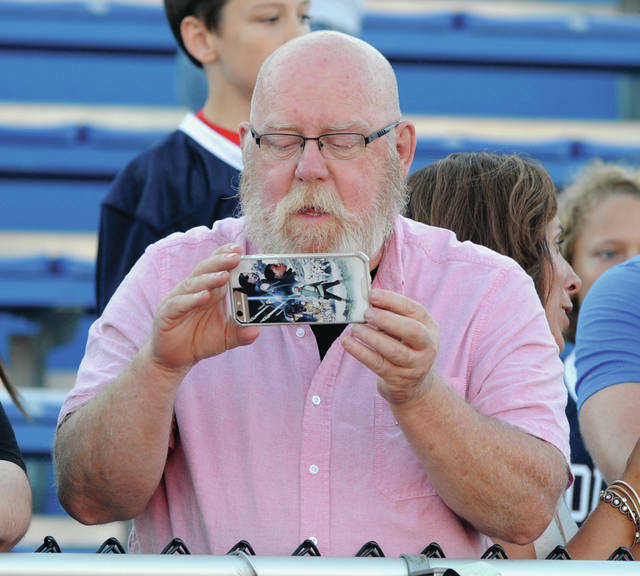 Amanda Ullery | for the Daily Call Retired Piqua Fire Chief Gary Connell photographs his granddaughter cheering prior to Piqua’s game on Friday. 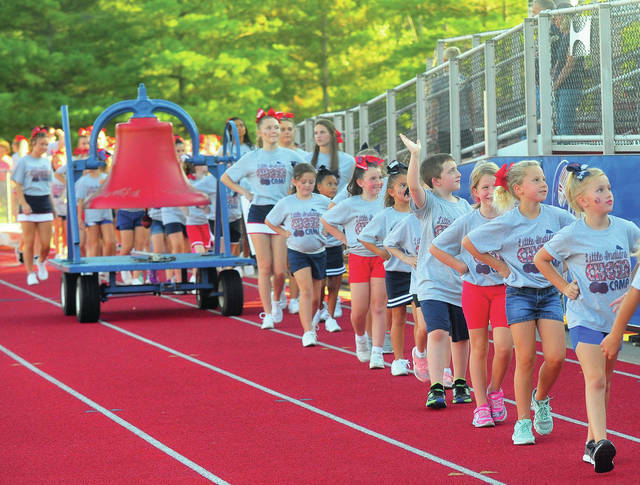 Mike Ullery | Daily Call Piqua’s junior cheerleaders were featured prior to Friday’s game at Alexander Stadium/Purk Field. 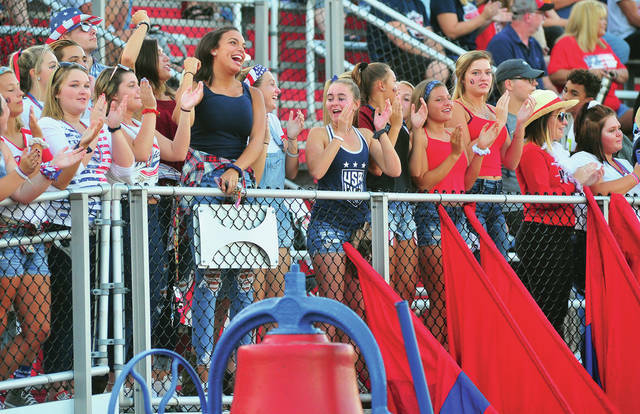 Mike Ullery | Daily Call The Indians student section celebrates a Piqua touchdown. 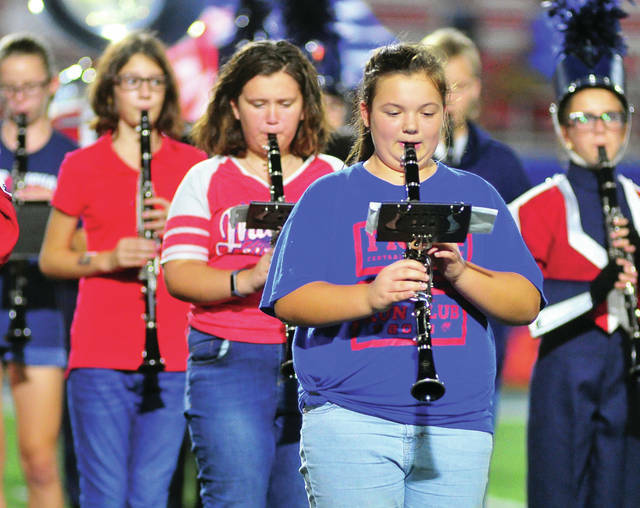 Mike Ullery | Daily Call The Piqua Junior High School Marching Band joined the Pride of Piqua on the field at half-time on Friday. Mike Ullery | Daily Call The officiating crew meets at mid-field as the second half gets ready to kick off. Amanda Ullery | for the Daily Call Garrett Schrubb, 6, makes a tackle against Fairborn. 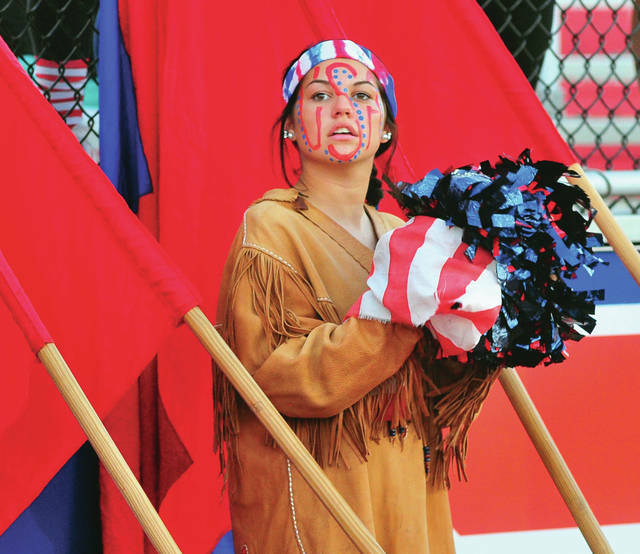 Mike Ullery | Daily Call Piqua Indians mascot Ellie Jones cheers at Friday’s game. Retired Piqua Fire Chief Gary Connell photographs his granddaughter cheering prior to Piqua’s game on Friday. Piqua’s junior cheerleaders were featured prior to Friday’s game at Alexander Stadium/Purk Field. The Indians student section celebrates a Piqua touchdown. The Piqua Junior High School Marching Band joined the Pride of Piqua on the field at half-time on Friday. The officiating crew meets at mid-field as the second half gets ready to kick off. Garrett Schrubb, 6, makes a tackle against Fairborn. Piqua Indians mascot Ellie Jones cheers at Friday’s game. https://www.dailycall.com/wp-content/uploads/sites/30/2018/09/web1_FNL1-2.jpgAmanda Ullery | for the Daily Call Retired Piqua Fire Chief Gary Connell photographs his granddaughter cheering prior to Piqua’s game on Friday. https://www.dailycall.com/wp-content/uploads/sites/30/2018/09/web1_FNL3-2.jpgMike Ullery | Daily Call Piqua’s junior cheerleaders were featured prior to Friday’s game at Alexander Stadium/Purk Field. https://www.dailycall.com/wp-content/uploads/sites/30/2018/09/web1_FNL4-2.jpgMike Ullery | Daily Call The Indians student section celebrates a Piqua touchdown. 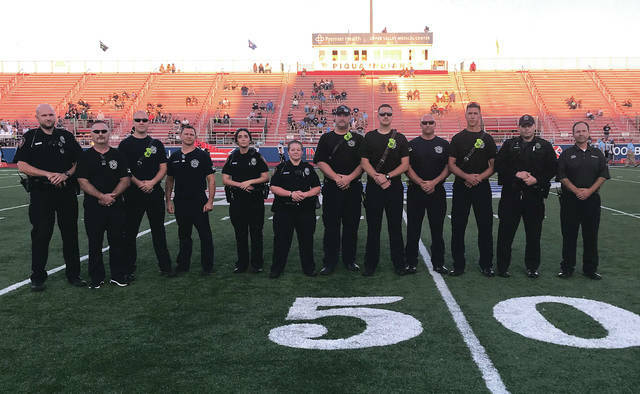 https://www.dailycall.com/wp-content/uploads/sites/30/2018/09/web1_FNL5-2.jpgMike Ullery | Daily Call The Piqua Junior High School Marching Band joined the Pride of Piqua on the field at half-time on Friday. 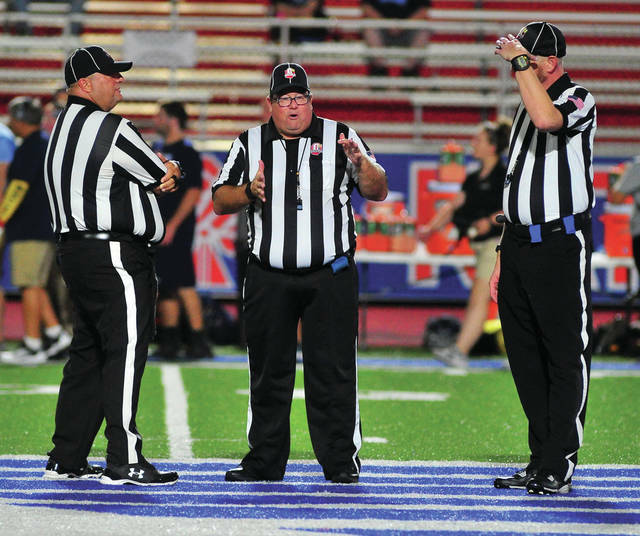 https://www.dailycall.com/wp-content/uploads/sites/30/2018/09/web1_FNL6-2.jpgMike Ullery | Daily Call The officiating crew meets at mid-field as the second half gets ready to kick off. https://www.dailycall.com/wp-content/uploads/sites/30/2018/09/web1_FNL7-2.jpgAmanda Ullery | for the Daily Call Garrett Schrubb, 6, makes a tackle against Fairborn. https://www.dailycall.com/wp-content/uploads/sites/30/2018/09/web1_FNL8-1.jpgMike Ullery | Daily Call Piqua Indians mascot Ellie Jones cheers at Friday’s game.